Nonprofits have astonishing stories to tell — about the constituents you serve, about your mission, about your organization. But too often nonprofits don’t know how to convey those stories effectively. At the Social Media for Nonprofits conference in Los Angeles on Monday, I gave a half-hour talk on “Storytelling 2.0: Harnessing video and commkunity to meet your nonprofit’s mission.” At 19 slides, it’s one of my shorter presentations, with more visuals and less text. It’s embedded above, and you can download it or embed it at DocStoc. • Yes, you have fantastic stories to tell, so don’t be intimidated into thinking that you need to learn some special craft to convey your stories. Do what works for you: Photo slide shows, blog posts, video interviews on a Flip or mobile device — or something more polished. But the most important thing is: Tell it! • Use personal storytelling to frame your issue. Don’t tell a story about homelessness, or world famine. Talk about how a particular individual is being affected. By bringing your story down to the personal level, you make it universal. • To tell stories is to be human. 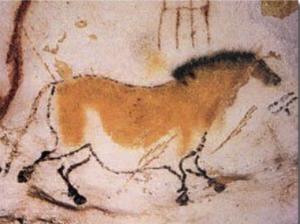 Storytelling is as old as the human condition, like this cave drawing from 17,000 years ago in Lascaux, France. • Storytelling 2.0 takes that basic human impulse and makes it much, much easier to create and share stories by using new technologies and social tools. Already we’re blase about the fact that the high-definition camcorder we carry in our pockets — an iPhone 4, Flip HD or Kodak Zi8, with editing software now built into our computers’ operating systems — would have cost $50,000 just 6 or 7 years ago. • Make it easy for both internal champions and external evangelists to participate. Find the storytellers in your community and schmooze them up. • Don’t think everyone needs to become an expert in video. The learning curve can be steep. So start with something easier, like photo albums and photo mashups, using sites like Animoto and Stupeflix. I’m writing this on the first day of a four-day trip to Santiago, Chile — my first time ever in South America, believe it or not — so please forgive any lapses you may see from a trek across four time zones, 15 hours of flying and 30 hours with almost no sleep. • How to maximize your nonprofit’s impact with YouTube (Socialbrite)JD Lasica, founder and former editor of Socialbrite, is co-founder of Cruiseable. Contact JD or follow him on Twitter or Google Plus. Non-profits require storytelling like Eve needed Adam, sometimes the fascination with what has been planted becomes greater than the value of relationship. Storytelling IMHO is the most direct reconnection with social good there is, it takes the mind off who is doing what, and back to why are where you doing it in the first place. This return to roots accompanies the heartbeat of storytelling. Storytelling isn’t a public relation exercise, which comes through in JD’s blog, and it is a conversation worth having, not the PR branded talking head, but a journey back to the future, the kind that the Cluetrain Manifesto once sparked, when it declared that markets are conversations. Storytelling is at the heart of human conversation and in a way, Amanda Marshall has it right that its “the human condition that keeps us apart.”, especially the pejorative word is being “conditioned”. That condition she rightly describes in her song as “superficial”. The other day I saw a leader in the SEO world taking stock against “article marketing”, so people within the nascent field of social media are self-correcting and advocating a march back to authentic spirit. When storytelling is the most authentic form of spirit there is, a non-profit must ask of itself what is it’s authentic spirit and that is easy to describe, it is a return to the most vital roots of social good, the way it should be and the way it still can be.